Paul Taylor of the Pew Research Center in Washington, DC, has written a data-rich profile suggesting where America is headed in terms of generational demographics. Along the way he compares us to other nations, and illustrates rapidly changing attitudes among younger generations about America’s presumed supremacy in the coming world. The four generations presently living in the U.S. are the Silent (born from 1928–1945), the Boomers (1946–1964), Gen Xers (1965–1980), and the Millennials (born after 1980). 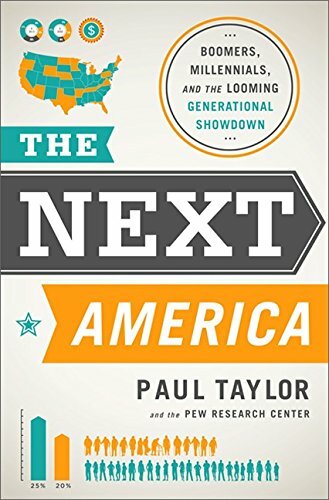 Taylor aims to illuminate geographic, economic, social, cultural, and technological changes that are currently reshaping not only America’s politics but also its families, livelihoods, relationships, and identities. Paradoxically, the strength of Taylor’s book is also its drawback. The Pew Center is famous for generating reams of survey data. As such it will be a valuable reference book for scholars and popular authors whose work touches on shifting demographics among the generations. But for the general reader the book’s copious tables and graphs may prove a distraction from the narrative that Taylor tries to establish with respect to a changing America. To the generalist, the book may come off as rich yet exceedingly dry. My 88-year-old mother read it and unexpectedly pronounced the book “fascinating.” It suggests that the typical reader is likely to be idiosyncratic. Readers willing to navigate the sea of charts and graphs will be rewarded with fascinating tidbits about our position in contemporary global life. Who knew that the rise of human longevity would make Japan’s market for adult diapers outnumber that for infant ones? No study of population trends can ignore the fact that 10,000 boomers cross the age–65 threshold every day until 2030 (the oldest boomers turned 65 in 2011). Taylor raises the point that if parents aren’t “old” thanks to Botox and titanium joints, then how can they expect their Gen X kids to grow up? He paints a portrait of Millennials as narcissistic, self-important, and holding themselves in high esteem whether they have done estimable things or not. Two centuries ago the French political philosopher Alexis de Tocqueville observed that “in American each generation is a new people.” Yet ever since the government started offering safety nets, families have increasingly reclaimed elder care that they had surrendered to the state. The multigenerational household now sees boomers and boomerangers living under the same roof as they once did in the 1940s and 1950s. At one time people aspired to own cars. Now smartphones are the coveted object of choice. Millennials’ relationship with technology is unique, Taylor argues, precisely because it is not something to which they had to adapt; it is all they have ever known. It has shaped their friendships, the way they learn, interact with groups and institutions, and allocate time. To Millennials accustomed to smartphones, talking is a “waste of time.” Texting is “less rude.” They have grown up knowing no other platform for social commerce. In the future, Taylor suggests, it is Millennials who will make the rules.